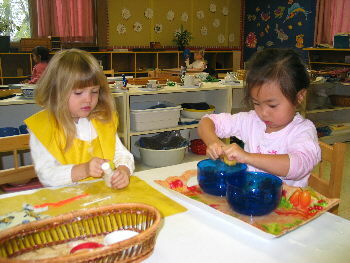 In the Montessori primary curriculum, most materials are self-correcting. This quality enables children to work on their own--without constant correction and discouragement from a teacher or other child. The process is self-education, building self-confidence through competence. The Montessori approach, therefore, forms a solid foundation for the child's education and life. The primary curriculum at Guelph Montessori includes concrete materials, like the Large Bead Frame being used in this photo. By working--primarily on their own--with these materials, children can more easily grasp abstract ideas. Our primary curriculum is a great option for families looking for nurturing, educational child care in Guelph. We provide an authentic Montessori environment where children are safe, comfortable and happy to learn.